One of the advantages of app-based gaming is the lower barrier to entry relative to traditional console games. As the living-room game boxes became ever more technically capable, they called for design sophistication and production values that have constrained creativity at many major publishers. When game development budgets rival feature films, it is not surprising to see the industry veer toward the sure-thing franchises and sequels common to Hollywood. Mobile game development is a bargain in comparison to other video game platforms. As a result, there is a flowering of creativity, and arguably a greater range of artistic expression. Spur of the Moment Games announced this week it is developing a mobile game designed partly to support the Occupy Wall Street movement with both funds and satire. 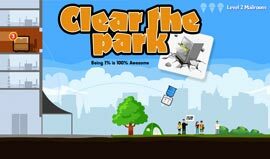 “Clear the Park” will be an iOS and Android game that allows you to play a high-profile and apparently seething corporate executive who wants to clear the nearby park of protesters because they are ruining his view. Your company stock increases as you come up with successful tactics for scaring or luring them from their occupation. You might toss watercoolers out the window at them or try negotiation. If you lose, then the protesters get to set up a Ken & Gerri’s Ice Cream Shop out of your former office building. Some of the proceeds of the game will be donated to the Occupy movement in the form of gift cards that protesters can use to buy necessities while they protest. Playing on the “99%” slogan adopted by many Wall Street occupiers, the game’s tagline is “Being 1% is 100% Awesome.” “It is all in good fun, but with an underlying sarcasm,” say co-creators Brad Thorne and Jerry Broughton. Thorne says there is an opportunity for games to widen their scope. Mobile has introduced more affordable means of production and distribution than ever before. The longtime Web developers have never deployed a game before but they say it is on track for a November release. “We have some PlayStation expatriates helping,” he says. 1 comment about "Satire To-Go: Occupy Wall Street To Be Mobile Game". Douglas Ferguson from College of Charleston, October 27, 2011 at 7:47 p.m.
Too bad these guys weren't around to trivialize social movements of the past, right?